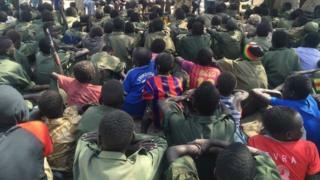 Around 300 child rebel soldiers in South Sudan sit proudly with their uniforms and rifles as they listen to their commander speak. There is a sense of excitement because soon they will be released into the care of the United Nations. "I haven't seen my mother and father since last summer," says Silva, one of the youngest there - aged 11. All the identities of the children are being protected at the official ceremony to mark their release after years of war - so Silva is not his real name. "I've seen many people killed when I was on missions," he says. "I had an AK-47. It was heavy. I was fighting to protect my family and village." The ceremony is led by Lt Gen Khalid Butrus Bura, one of Silva's commanders in the South Sudan Democratic Army Cobra Faction. It is the powerful militia in Pibor county in Jonglei state and has been at war with government forces for more than three years - one of numerous conflicts to hit the world's newest nation since it gained independence from Sudan in 2011. But now there is calm in Pibor and a peace deal has been signed by their leader David Yau Yau, who said he took up arms to win greater rights for his Murle ethnic group, and the government. Before their release into a specially made UN compound in the village of Gumuruk, the children chant his name "Yau Yau" - their final battle cry. Now for the first time in his short life Silva has ambition for his future. "I want to go to school and learn. I don't want to fight anymore; I was scared," he says. Sitting next to him is 12-year-old Abraham (also not his real name). He may be a child but he carries the weight of a war veteran. "I was scared for my life; I felt like I had to fight," says Abraham. "Two of my sisters were murdered. I too went on missions and watched as people dropped down around me. "I'd like to go to school now and be an administrator for Pibor county." The fighting in Pibor is separate from the wider rebellion that erupted in South Sudan in December 2013 in which more than 50,000 have so far died. The UN believes thousands of children have been forced to fight in that conflict on both sides. The UN's children's agency says the children being demobilised today will be offered education and psychological support before the slow process of trying to reunite them with their families can begin. Jonathan Veitch from Unicef says the ceremony was a significant moment and in total 3,000 child fighters will be released. "It's the first release of its kind and considering there is a large amount of forced recruitment of children in South Sudan's civil war, the fact we can demonstrate we can get young boys out of uniform and into school is a real sign of hope for the future of this country." The future of these young boys, many of them said they were only protecting their villages and families from government attacks, depends on the commanders who too easily send them to war. I asked Lt Gen Butrus Bura, who led the children into into war but he also negotiated their release, if he promised not to use them again. "Yes. I promise. We want the children to have an education," he said. "We no longer want them in war. They only fought because it was a particular moment in our history. They will never fight again." Before we left Pibor county we spotted a young former soldier sitting alone outside a UN tent. He had taken his combat uniform off and told me he was 15. Peter, as we are calling him, looked years younger but was one of the few here who spoke English. "I am no longer afraid," he said. "I want to school, become a pastor and help my village and family." Despite the brutality and violence they have experienced, the children of Pibor county now have the chance to begin again.